So glad that they are in a good home with you there. I bet they are a blast to be with. Thank you for rescuing the odd couple, they are adorable. I have a Rescued Jack Russell, the first one I’ve ever had of that breed. She is so much fun! We have rescued most of our pets as well. Good for you! Aww..i just love dogs..and i love anyone who takes the ones others have given up!!! My girl has a couple "defects", but shes perfect to me!!! How awesome of you to give a forever home to the Odd Couple! That, by the way, cracked me up! They are just adorable! Welcome to the team! I'm mom to two, Mutt a 55 pound Ike dog. They means they picked him up off the streets after hurricane Ike and he was to stay with me till his family came for him. Well Ike was 9 years ago, I don't think anyone is coming. Actually After 3 months the pound said the family still might come forward but they had only said they would hold him 3 months so as far as they were concerned he was mine. Duke a Yellow lab, I took from a family that was taking him to the pound because they were moving into an apartment that wouldn't take a dog over 40 pounds. Hi! We love all animals but prefer the bigger ones. I’m currently a fur mom to an odd couple. 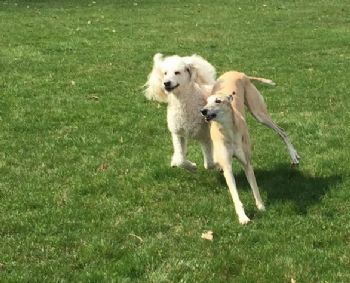 Henry is the standard poodle and BeeBee is the greyhound. Both are rescues...we’re Henry’s 3rd family and he’s an awesome boy. Definitely the smartest dog we’ve ever had. I forget he’s not human and he never knew he wasn’t. BeeBee came off the race tracks in West Virginia. She was the 3rd greyhound to make us her forever family. We’ve also fostered about a dozen and a half greyhounds but aren’t currently active fosters. These are 2 breeds I never thought we’d be attracted to, but stuff happens in life and here we are with no regrets.